Cairns self-confessed single mum, Bree Collison, is mummy to a beautiful baby girl Charlotte. She's just set up a Facebook group called 'Cairns Mum's' for mothers in and around Cairns. "Post any meetings, walk you do or any other activities you like to do with your bub's," Bree Collison. Just over 100 have linked up and sharing stories and information, and it's fast becoming a hit. "Hopefully soon I wont be as tired and will have energy to go for walks again," Bella Sara says. "We should all organise events or something I need other mums to hang out with from time to time most my friends don't have babies." 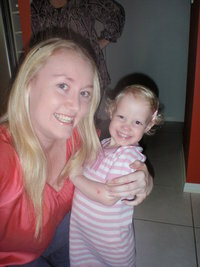 Corrie Bateman, who moved to Cairns last year, with a 10 month old daughter, is using the site to connect with other mums. "We dont know anyone in Cairns so if anyone wants a friend count me in. We are free for coffee." Trudy Gilholm's new bub was born in January, and was her first baby. "My partner and I moved to Cairns November 2008 and are looking to get to know people with kids," Trudy says. "We just found out last week that we are expecting a little girl! We are very excited. Looking forward to getting to know you."